This hotel couldn't have a better location—on the Zócalo and close to a gaggle of museums, restaurants, and historic buildings. You'd expect nothing less than to be in the heart of the colonial city, given that one wing of the building was once the home of Hernán Cortés. Rooms are nicely appointed, with wood floors, ornate headboards, crisp white bedspreads, and flat-screen TVs. The restaurant and bar have sweeping views of the Catedral Metropolitana and Palacio Nacional, though by law, minors aren't allowed on the smoker-friendly terrace after 5 pm. Standard rooms are extremely small (about 180 sq. ft.), but high ceilings make all the rooms feel more spacious. Leather, wood, iron, and pewter appointments add warmth to the otherwise simple design. The Family, Superior, and Junior Suite rooms—some with Zócalo views—are more than twice as big as standard rooms, though usually priced only slightly higher. Bathrooms are smartly designed for their limited space, and the custom toiletries are of good quality. YOU SHOULD KNOW Some rooms have better water pressure than others: Check the water pressure in the shower before the bellhop leaves your room. The on-site café and a sea of comfy club chairs with nailhead trim make the lobby a great air-conditioned place to relax with a quick coffee or drink while sightseeing. A basic gym is available 24 hours, with towel service and a steam room. 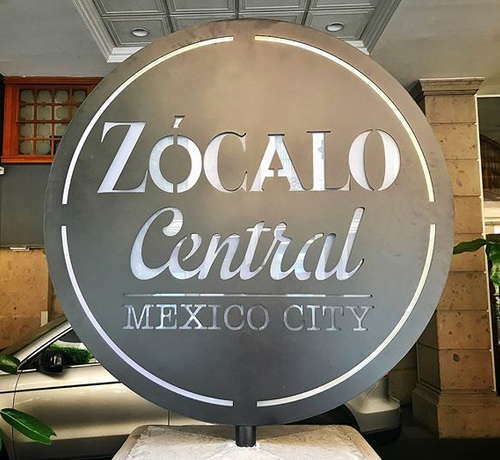 The Balcón del Zócalo restaurant has one of the best views in town, on the 6th floor directly overlooking the Zócalo with unobstructed views of the Catedral Metropolitana and Palacio Nacional. Still, it would be worth a visit regardless. Chef José Antonio Salinas Hernández (who used to host the cooking show "Tu Cocina") serves modern takes on traditional Mexican dishes, like beef-tongue peneques (a sort of mini-quesadilla) and salmon in tamarind mole. Open daily from 7am to 11pm, even Sundays (a rarity). Café Central, the lobby café, is perfect for coffee, drinks, or snacks to go. The elaborate tasting menu is a bargain (8 courses for about $40, at the time of this writing). Ask the hotel to reserve you a table at the edge of the terrace, lest Instagramming tourists block your view. Even if you don't stay for a meal, you'll at least want to have a drink at Balcón del Zócalo (let the host know you're staying at the hotel in case it's crowded). Uncommon in Mexico, there's a good selection of wines by the glass, icy micheladas, and terrific gin and tonics. You can easily walk to anywhere in the Centro. For the more adventurous, the hotel offers complimentary bike rental, and the Zócalo subway stop is less than a block away. El Cardenal (2-minute walk), a classic restaurant for breakfast or lunch located in one of the area's most beautiful buildings, is just around the corner. Limosneros (7-minute walk) serves inventive Mexican cuisine in a 17th century building with 21st century interior design. For a locals-only experience, hit the taco stand Los Cocuyos (11-minute walk). Bar La Ópera (8-minute walk) is a luxe cantina which was an early-20th century political and literary hangout, and an obligatory stop to see the bullet hole that Pancho Villa left at the dawn of the Mexican Revolution in 1910. jazz lovers can't miss Zinco Jazz Club (4-minute walk) in the basement of an old bank. Hilaria Gastrobar (3-minute walk) is one of the city's best craft beer bars, with around 200 Mexican beers and not a Corona in sight. Location, location, location! it's hard to find a hotel in this area that strikes such a good balance between quality and price. The staff is exceedingly friendly, and available 24 hours. A wide range of affordable tours—without the usual hotel markups—can be booked directly through the hotel as well.